Sky Rink is the home of Adult Ice Hockey in New York City. A New York City landmark, Sky Rink features two rinks, over 100 adult hockey teams, and instructional programs accommodating more than 1,500 participants. 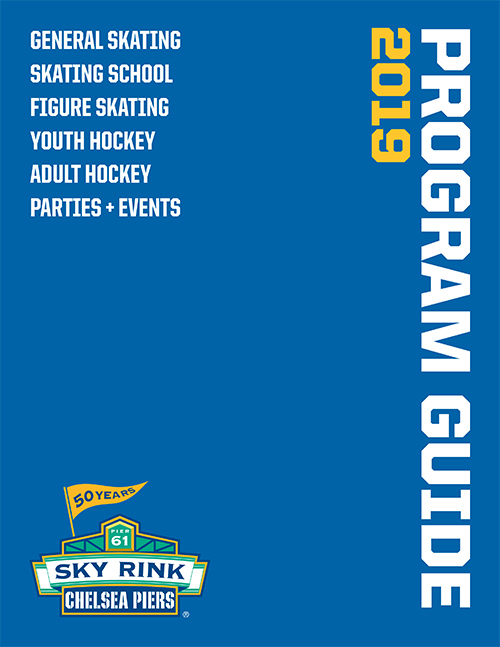 Boasting one of the nation's most comprehensive adult hockey programs, Sky Rink offers ice hockey players of all levels the opportunity to play year-round. With 11 divisions and 100+ teams, Sky Rink offers New York's most comprehensive Adult Ice Hockey program. The Adult Hockey Prep program is for new players with beginner / intermediate skating ability. This introductory program focuses on hockey fundamentals, for players ages 18+ with limited or no ice hockey experience. Weekday Open Hockey is available for players 18 years of age or older. Sky Rink's Top Shelf Hockey Training Center is a state-of-the-art practice space designed for adult hockey players. Monthly or yearly rentals are available for small/medium lockers.